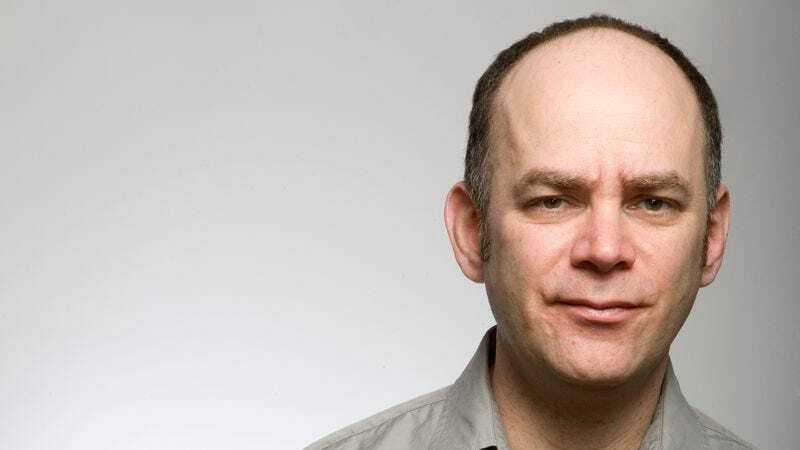 Comedian Todd Barry is known for his deadpan delivery and memorable appearances on Dr. Katz, Delocated, and most recently Louie, on which he plays a version of himself. He’s also an occasional drummer and has sat in with Yo La Tengo. His latest project, The Crowd Work Tour, is available on Louis C.K.’s website, and features Barry making an evening out of riffing with his audience. Todd Barry: It was at Coconuts Comedy Club in North Miami Beach, Florida. It was November 1, 1987. Sunday night. It was an open mic night, and I did five minutes. The A.V. Club: What was going through your mind when you got up on stage? TB: I don’t know. I was nervous. My heart was definitely racing. I was kind of surprised that I was able to do it. AVC: Did you have material prepared? TB: Yeah, I wrote it all out. I had some McDonald’s and circumcision material. I don’t remember what the jokes were—just something about working there and Jewish ritual. Nothing groundbreaking. AVC: Were you the class clown growing up? TB: On some level I was. I never really got in trouble. I got warned and then I’d back off. I never got sent to the principal’s office or anything like that. AVC: Were you gathering material in your mind for later? TB: No, that wasn’t the plan. AVC: What was the plan? TB: I had no plan initially. I didn’t know until seven or eight months in that this is what I’d be doing, but I was doing it every night. I just didn’t plan on it, so it freaked me out that I was pursuing it. TB: I had some of Steve Martin’s albums, and George Carlin’s, Martin Mull, and my brother’s Cheech And Chong albums. I don’t know which one I got first. AVC: Who had the biggest influence on you? TB: I don’t know who really influenced me. I saw Letterman way early on. I was aware of him before the show when he was just doing stand-up. AVC: What was his stand-up like? TB: It’s pretty much the way you would think—his tone. Nothing much different than you would expect. I don’t remember a lot of his jokes. TB: I think it was a [stand-up] show in Canada. It’s weird I don’t remember specifically. There were two shows. One called “Spotlight Café” which was done in SoHo somewhere on Greene Street. There was this other show done in Hamilton, Canada just across from Buffalo. It was relatively easy to get on that show, so I think I did those two first. AVC: Was there a difference performing in front of a camera? TB: Yeah, that’s always a little nerve-racking. I remember being pretty excited, though, and I was able to do my set and get laughs. I guess when you get nervous on TV, you have to remind yourself, “I’ve done this before, and it’s gone well.” Not always, but sometimes—a lot of the time. AVC: Is there a difference in timing when the cameras are there? TB: When you do a show like Letterman, they are much more likely to applaud in places where you would never get applause like in a club. I think they’re just more trained to applaud, so you kind of have to ride that. You don’t want to do a joke and then have to wait for it, but you don’t want to necessarily cut them off. You have to let them do it and then cut them off. TB: I didn’t think of [The Wrestler] as a dramatic role. The movie was dramatic certainly, but I was a wiseass, so it didn’t feel that different except it was an intense movie. And Mickey Rourke was the guy I was doing scenes with, so it was certainly intimidating. TB: I was around 13. I took lessons in Florida. I played a little with a friend of mine and then ended up joining this band, The Chant. I’m not sure how I found out about it. Maybe I answered an ad. And then I brought this friend into the band. That lasted a couple years. We played around Florida and made an album. Sort of gangly garage pop. TB: I was doing Catch A Rising Star way early on, and he was sitting in the back. I saw him laughing and he kind of came toward me. I thought, “Oh, no, I’m in trouble. I must have done one of his jokes.” He just had a thought about one of my jokes. “Have you thought about doing it this way?” It was so surreal that he was in the room, and he was laughing, and then bothered to say something. AVC: How did your appearance on Comedians In Cars Getting Coffee come about? TB: I was getting frozen yogurt with my girlfriend, and the phone rang. I didn’t recognize the number, so I just let it ring. Then I checked the message. It was like this minute-and-a-half message from Seinfeld. He kind of equated it with him getting a call from The Tonight Show for the first time. I don’t even know how he got my number, but I’m sure he has ways of doing it. He called back and asked, “Is there any car that has memories for you or is important in your life?” I told him I’d never been a big car guy, and I’m 99 percent sure I’ve never been in a sports car. He’s like, “Okay, that’s something we can work with.” The whole thing was surreal, because it wasn’t just riding in a car: There are cameras following you and cameras on you, and you’re with someone you don’t know very well. You’re supposed to be entertaining and trying to be. He was nice. We hung out for three or four hours. TB: I used to do magic shows at the library with a friend of mine when I was 11. I have no idea how I got booked. I know I did the shows, but I can’t imagine. It was a very brief phase I went through. My fifth grade teacher used to teach magic. I don’t think I ever took his class, but I think he taught me a trick or two. There was this one slight of hand where you look for a red ball under this bowl and then all of sudden he lifts the bowl, and there’s a bagel underneath. I went through a phase where I had a subscription to The Society Of American Magicians magazine, and there was this other one called Genii. I think I was as intrigued with the culture as the tricks. TB: I was in my thirties and some friends from the Luna Lounge were going to Paris, so I bought a ticket. Then they went on to Portugal and I stayed by myself for an extra day. It was surreal being there and not speaking the language. At that point, I’d only been to Canada and the Bahamas. It kind of knocks you off your feet, because it’s so different. I think I did a lot of “bonjour” and “merci” and a lot of pointing—walking around and being alone sometimes just gets the mind wandering.